Winter in Pennsylvania can be exhausting. By February of 2018 we’ve had plenty of snow days with school closings and were tired of cold, grey, and wet weather. Our family were anxious to get some warmth and sunshine, so we planned a short 3-day trip to Florida to explore some of its national parks. Lately I’ve been fascinated with national parks of United States. An initial interest was planted by a few amazing outdoor photographers that I follow, especially Seth Hughes, Jonathan Irish, and Stefanie Payne (the last two went on an amazing year-long road trip and documented it in their book). Then we visited Acadia and Shenandoah in 2016, and I was hooked. So far we’ve been to 7 out of 58 national parks in the US and I would love to see as many of them as I can. I planned this trip 2 weeks in advance, and on a very short notice a family of our friends decided to join us. The most convenient and affordable flights from Philadelphia were to Fort Lauderdale, so we decided to fly there for the first time. We were arriving late on Wednesday and leaving early on Sunday, so I wanted to stay not too far from the airport and found a nice house on Airbnb about half an hour to the north at Lighthouse Point, FL. Miami is about as far to the south, but I tried to avoid traffic and busyness of the city while still being near the ocean. In retrospect that wasn’t a great home base location for our trip, as we had to drive 1-1.5 hour to our primary destinations and didn’t really have time to visit beach anyway. Staying somewhere around Biscayne Bay would save us some energy and an hour or two of driving every day. We left to the airport after work and at 9:09pm landed at FLL. I love the feeling of entering one airport terminal in winter and exiting another one in summer! Picked up our rental cars, stopped by a supermarket to get some groceries, and finally got to our house around 11pm. We had a late start and enjoyed a relaxing breakfast in a backyard, so our schedule for the day got a little tight. Our first destination was a south part of Everglades National Park. This park is the 3rd largest national park and the largest tropical wilderness in the contiguous United States. It’s pretty remarkable how much land it takes in southern Florida while cities cover only a narrow stripe on the east. Everglades protects a network of wetlands and forests fed by a slowly flowing river out of Lake Okeechobee. It’s mostly known for alligators, birds, cypresses and mangrove forests. Just because an alligator or crocodile may appear lethargic does not mean that it cannot quickly resume activity to defend itself. Though most would rather flee than attack, alligators and crocodiles are wild animals whose behavior is unpredictable. Always keep a safe distance when viewing wildlife in the park (15 to 20 feet; 4.5 to 6 meters) and do not harass or feed wildlife. Alligators and crocodiles have plenty of natural food here and do not seek out humans or pets. However, do not mimic prey-like behavior which may attract these animals. TL;DR: Don’t be an idiot, they are wild animals. If you have time to visit only one place in Everglades, I’d say it should be Anhinga Trail. After that, we drove to Pahayokee Overlook, which is about 20 mins away. It’s a raised observation platform on a boardwalk loop that provides a pretty cool overview of the endless "river of grass”. Not worth a trip on its own, but gives a good idea of the size of the park. On our way back we stopped by Nike Hercules Missile Site from Cold War era, but sadly it was closed. Seems like it is accessible only during ranger-guided walks, so check their schedule ahead of time. We also planned to go to the beach in one of Florida Keys’ state parks that day, but because of the late start decided to skip it. On our way home we stopped by a roadside diner and got grilled alligator for a very late lunch, which tastes somewhat like chicken. That day was a highlight of the whole trip and something we all were really waiting for. We went to explore Biscayne National Park, which preserves Biscayne Bay and its offshore barrier reefs right near downtown Miami. 95% of the park is water and boat is required to see it. We went with a tour from Biscayne National Park Institute as it’s an official partner of the park and had great reviews. 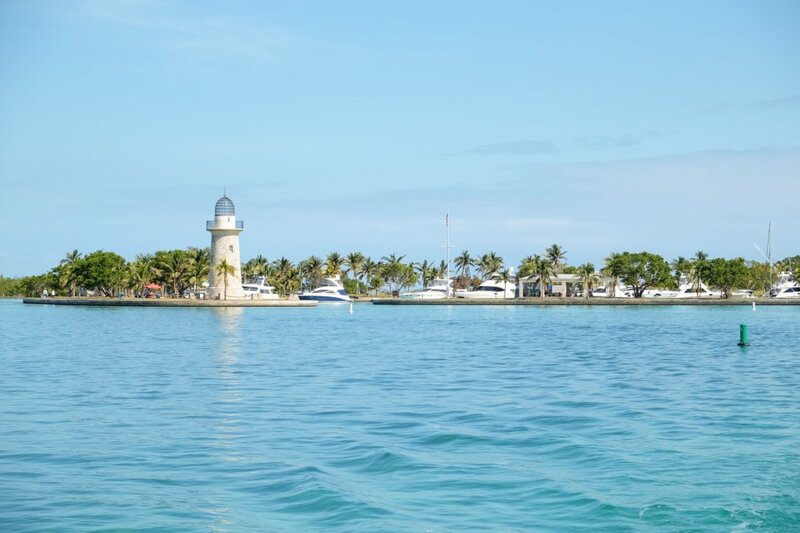 There were 6 of us, so we took a private day-long tour on a sailboat with a stop ashore at Boca Chita island for hiking, paddling, and snorkeling. The day started with an overcast and almost zero wind, so we had to use an engine on our way to the island. My daughter bombarded captain with questions and spent most of our trip at the helm. We returned to a sailboat and switched to paddle boards and kayaks to go alongside the fringes of the mangroves, see coral reefs up close, and go snorkeling. Water is still chilly in February, so we mostly paddled around and after a quick dive just laid on paddle boards observing fishes through a snorkeling mask. I really regretted not having any camera with me on this trip, so after returning home I got a GoPro and waterproof phone case for the future. By the time we got back it was time to return to the marina. That time there was a slight breeze and we set sails for a little while. The moment engine is turned off in the middle of the bay and you can only hear wind and water is absolutely magnificent. We were followed by dolphins for a little bit and saw a sea turtle or two. The bay is not too deep and water is really clear so you can see everything on an ocean bottom. After 2 hours of sailing and motoring, we were back at the marina. Even while the weather wasn’t perfect that whole trip was great. I’d love to come back and explore different parts of the bay on a kayak another time. Everglades is so big we had to plan a separate trip to see its northern section. There we went on an airboat tour with Everglades Safari Park, which was a little disappointing after a visit to Anhinga Trail. Even while the ride itself was pretty entertaining we saw only two alligators and not as close as on the trail. Our guide told a freaky story about Burmese pythons in Everglades. Apparently, a nearby rep­tile-breeding facility was destroyed by Hurricane Andrew in 1992 and lots of pythons escaped to the wild. Right now there are about 30,000 pythons in Everglades and 100,000 in Florida, so authorities let hunters kill as many of them as possible on state lands. The weather was quickly getting worse, so we decided against continuing our trip to Ten Thousand Islands region and drove home to enjoy our last evening in Florida. What to see next time? National Geographic Complete National Parks of the United States — a great general reference to what not to miss in every region. Your Guide to the National Parks by Michael Joseph Oswald — a more detailed guide useful for planning specific trails and routes to visit in every park. All photos were shot on iPhone X and Fujifilm X-T1 with XF18-55mm and XF55-200mm lenses. Only after coming home and getting ready to process photos from the camera I discovered that it was set to shoot JPEG-only after I lent it to a friend and didn’t check settings on return. That means all photos are shown almost “as is”, aside from some minimal exposure and cropping.